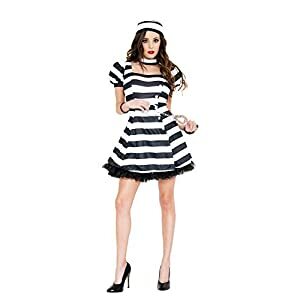 Women’s Convict Cutie, Including: Top, pants and Hat, Ideal for outdoor or indoor events, Perfect for Carnival and Theme parties. Size 10-12: Bust: 37 -39 inch, Waist: 29-31 inch, Hip: 40-41 inch, lightweight material for comfort avoids overheating. Easy to put on and take off thanks to elastic waistband and Velcro fastening. Includes playsuit with belt. Print detail on back ‘most wanted’. Orange prisoner short sleeved fitted shirt with decorative screen print. 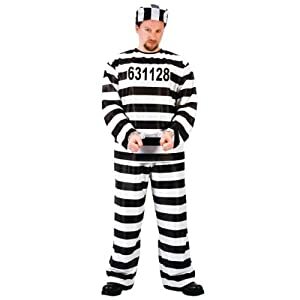 Perfect for DIY costumes and customizing your personal look. Spot clean, line dry. Do not iron. Available in small, medium, large, extra large. 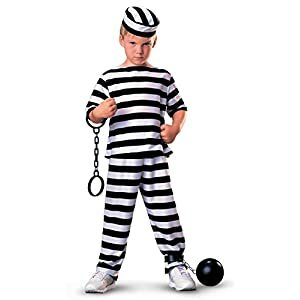 High quality costumes presented by Underwraps Costumes. One button thru pocket. Dress with screen print, hat. Dress, hat. Wet look zip front romper. Printed department of justice. Hooded romper. Garterbelt with adjustable garters. Matching G-string and hat included. 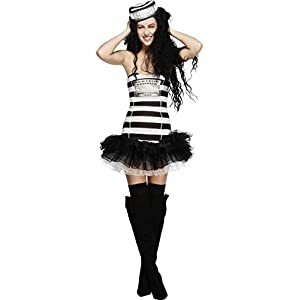 MUSIC LEGS Jailhouse Hottie for sale for Halloween. Handcuffs. Handcuff belt. Includes dress and hat. 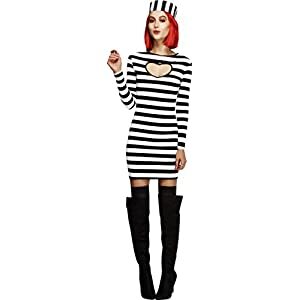 Wig, hold-ups and boots not included. Exclusive Fever branded product. Includes dress and cap. Wash gentle cycle cool, lie flat to dry. Includes tutu dress and hat. Wig and boots not included. Exclusive Fever branded product. Button details. Short puffy sleeves. Ruffle trim. Includes dress and hat. 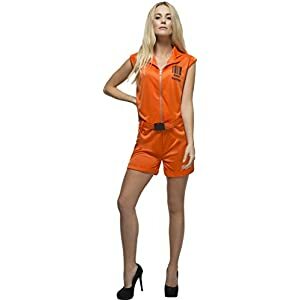 Handcuffs not included. Exclusive Smiffys branded product.